Located near the intersection of S Dobson Rd and W Germann Rd intersection, Extra Space Storage serves residents of Chandler and Sun Lakes. Locals will recognize our facility behind CVS next to Tri-City Baptist Church and Chuparosas Apartments. 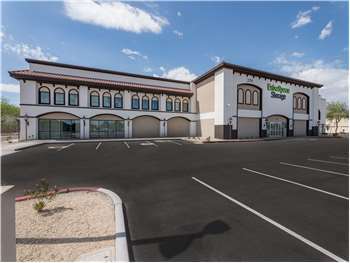 Looking for self storage close to the airport? Extra Space Storage is about 4.4 miles from Chandler Municipal Airport, providing easily accessible options for Chandler residents and visitors. Extra Space Storage on S Dobson Rd offers customers a wide range of storage units, climate-controlled storage, and exceptional security. We're the storage solution for you in Chandler! If I could give a negative rating that's what Extra Space Storage WOULD BE GETTING!! The guys at the location are great, it's the company is SHADDY!! I've had my storage not even 5 months & my cost for 10X20 went from $189. To $213!! Almost $50 increase!! No explanation why. . SHADDY!! Super cool staff and they had carts available free of charge to borrow. This was a nice feature been ng that we weren't able to rent a dolly for our move. AZ 101 Loop S; Take exit 61A for Price RD; Turn left onto W Germann Rd; On cormer of Dobson & Germann. Take I-10 W; Take exit 164 for Queen Creek Rd toward AZ-347 S; Turn right onto E Queen Creek Rd; Turn left onto Dobson Rd; On corner of Dobson & Germann. Take AZ-202 Loop W; Take exit 48 for Alma School Rd; Turn left onto S Alma School Rd;Turn right onto W Germann Rd; On corner of Dobson & Germann. Take AZ-202 Loop E; Take exit 50B for Price Rd; Turn right onto Price Rd; Turn left onto W Germann Rd; On corner of Dobson & Germann.